Associates from Copiah-Lincoln Community College. Bachelors from Mississippi State University. Currently seeking Masters from William Carey University. 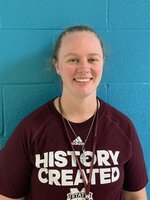 Drivers Education, Health, and PE teacher at Coahoma County High School in Clarksdale, MS.
-Head JV basketball coach, assistant high school basketball, softball, and soccer. Girls high school PE teacher at Columbus High School in Columbus, MS. I am from Florence, MS. I have a large family with 3 brothers, 1 sister, and 4 nephews. I love sports, hunting, and fishing. I love to be outdoors. I am married and have a 3 year old little girl. I have 1 dog and 1 cat.